Finding a timber buyer that’s reliable doesn’t have to be hard. If you need someone to give you top dollar for your timber, call Walnut Timber Buyers right away. Here, we purchase standing timber and cut logs, with a focus on walnut and white oak veneer. We cater to many different job types, from farmland to recreational properties to hunting grounds. Unlike other similar companies who are only out for their bottom line, we get you the best money for the product you have naturally on your land. However, most people are unaware they have valuable timber on their property. Are you unsure? There’s no better reason to call us for a consultation. We give you good money, plus we use responsible practices and always clean up after ourselves. Choose the most reputable timber buyers in IL, IA, MO and WI. We help a variety of clients with the timber buying process. With walnut timber prices at an all-time high, there has never been a better time to sell than now. Landowners are our main clientele, helping them make the maximum amount of money due to the absence of middlemen. That’s because we are direct exporters to overseas markets. As purveyors of Midwestern walnut for the global economy, we welcome importers of round logs. We operate our own container-loading facilities as well as trucking services to rail yards. Most importantly, we manually inspect for peck prior to export. 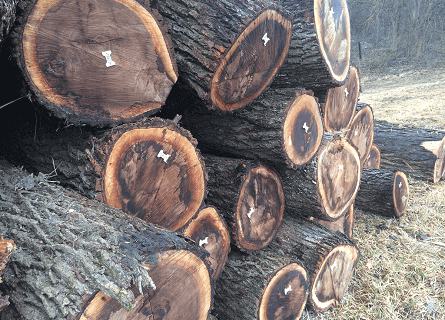 We buy cut logs in Iowa, Illinois, Wisconsin and Missouri. If you have logs for sale, please call for an appointment with one of our licensed timber buyers. So, if you have standing timber or cut trees to sell, call us now. 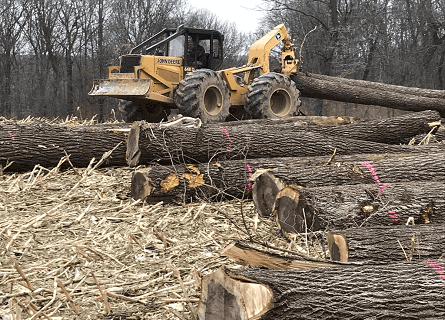 For access to timber buyers in Illinois and the surrounding states that you can rely on, please contact us at (309) 326-9711 or fill out our online form. We promise to contact you within 24 hours.